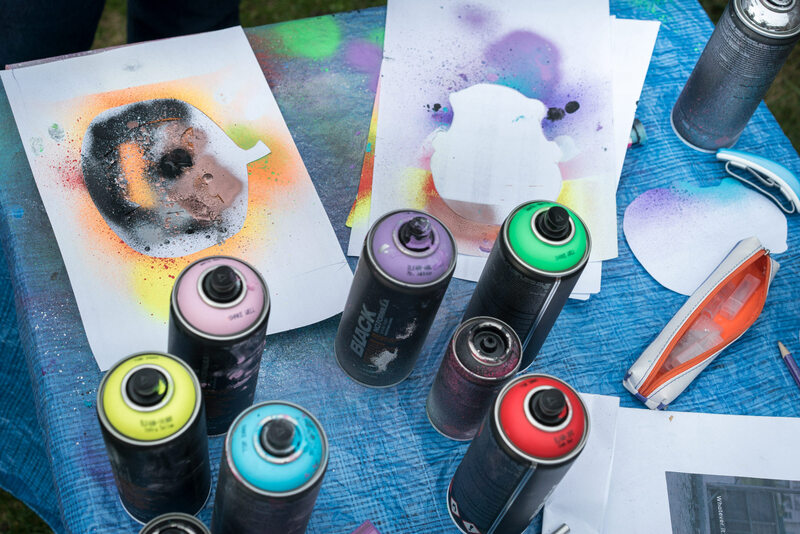 After a hard day at the office in Canary Wharf, Kerry Gray likes to cut loose by cracking open a few tins of spray paint and getting creative. Unlike some of the other teachers who’ve offered us lessons, Kerry is a still a beginner. She recently went on a short course with a friend and enjoyed herself so much that she’s decided to start a small business, selling spray painted signs. As the old saying goes, however, teachers only need be one step ahead of their students, and Kerry was certainly at least one step ahead of us. After cutting stencils and placing them on our canvasses (we’re a long way from being able to freehand paint), we started to spray. The paint flew everywhere – on our hands, on the table, on Kerry’s clothes… The bits that did hit the canvas looked messy, and we needed a lot of assurance from our teacher that this was, in fact, the desired outcome. Despite causing more mess than we thought possible, the finished products looked pretty good. By the end of the lesson, we were trying things that Kerry hadn’t yet tried herself and learning by trial and error, which was a lot of fun. For somebody who’s just taken up spray painting, Kerry was a great teacher and it was encouraging to see somebody who’s just learnt a new skill pursuing it so hard. When our pieces were done, we asked Kerry more about her hobby – why she loves spraying so much, and where she’d like to go with it. What have you been teaching us today? 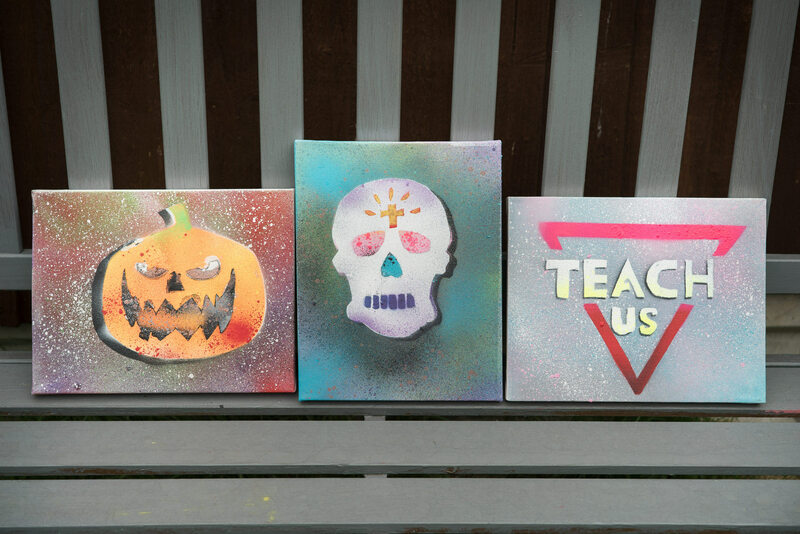 How to use spray paint to make graffiti signs and art. I’m an amateur, but it’s a hobby that I really enjoy. I found a course on Groupon and went with a friend. We both like arts and crafts and wanted to try something different. I really enjoyed it and have carried on making chalk paint signs ever since. Is there someone that has influenced you? I just always liked art at school. More recently, I’ve been painting kids faces at my kids’ school and have gotten better and better every year. After going on the course, it seemed like I could use my art skills to transfer into spray painting. 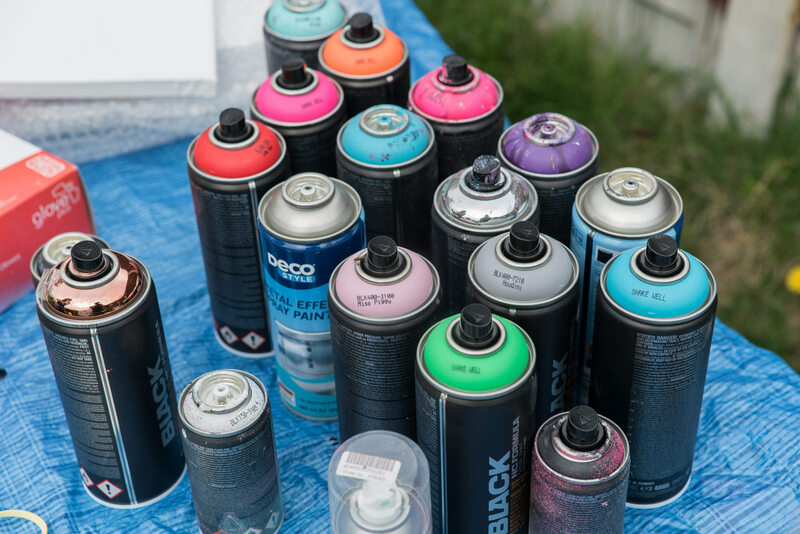 What do you like spray paint art? It just feels really rebellious. Even though it’s on canvas and I’m in a nice clean environment, it feels naughty to do that first spray. It’s a very quick way to do art, and taking off the stencils is so exciting – you never know what you’re going to get. Have you ever made any catastrophic mistakes? I recently made a sign for a friend using three different skylines and cut the stencils backwards. He still liked the canvas though, thankfully! Did you enjoy teaching us? Yes, I loved it. You were really artistic and it was great to be able to show other people how to do what I do. You don’t realise what you know until you see someone else trying to do it and you can step in to say, ‘not like that, like this instead’. Yes, absolutely. Anyone can do it. It’s more difficult if you want to do it freehand, but it’s easy to just buy stencils if you need a bit of a helping hand. What do you aspire to produce? I’d like to do more proper graffiti. There’s a group called Graffiti Kings in London who I’d go to for lessons if I was braver. They’re all so young and I’d be terrified of being the oldest one there! Who’s the most skilled person you know? There’s a face painter I know called Debs Mills and she’s amazing. She’s been face painting for as long as I have, but must’ve practiced more. Her roses are so good and it’s those she’s known for. She uses a technique called one stroke and I’ve been on courses with her expecting the magic wand to be waved, but it wasn’t. I can’t do what she does, so I look up to her. Another skill you wish you had? Definitely singing. I’m quite terrible at singing, but that doesn’t stop me! 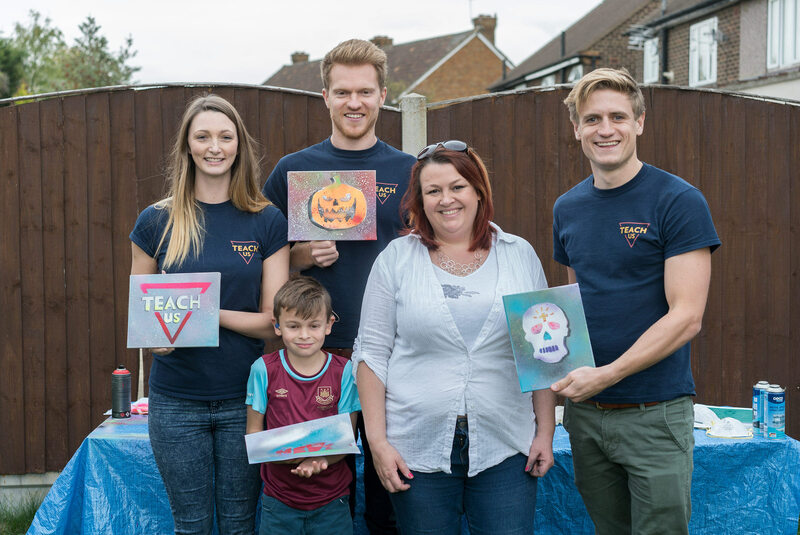 The teach us team with their teacher Kerry Gray and her son. The amount of pressure you apply to the button on a spray paint tin changes the effect it creates. Lots of pressure results in full coverage. Very little pressure results in drizzling. Not all graffiti has to be done on the side of trains, or inner city walls. It’s possible to teach somebody a skill that you’re still learning yourself. There’s no need to be an expert if you’re passionate about what you’re doing. It’s the art of helping one’s self. Chemicals are overused and overrated.